CSUN’s Department of Criminology and Justice Studies is working closely with the Los Angeles City Attorney’s Office to help officials there evaluate the effectiveness of some of its programs. 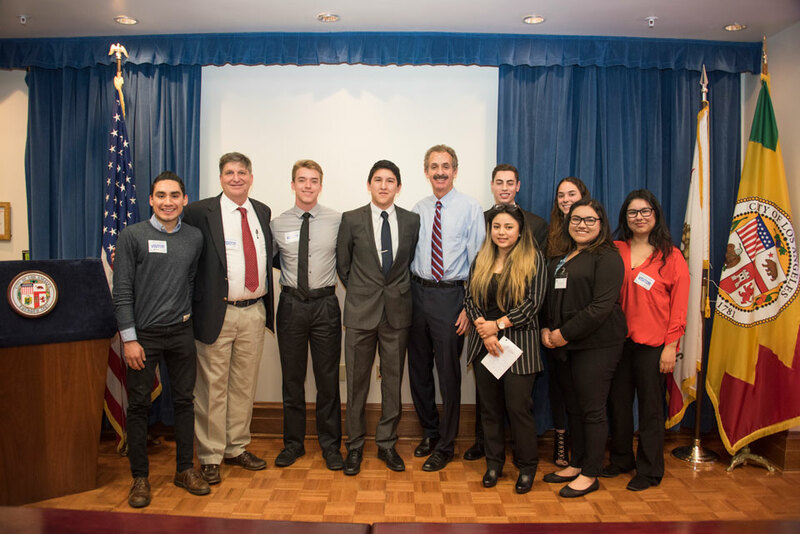 Students met with Los Angeles City Attorney Mike Feuer and other members of the City Attorney’s Office staff and legal team last month to talk about their research. From left are David Contreras Zuniga, CSUN criminology and justice studies professor Bruce Zucker, CSUN students Justin Brooks and Felipe Villa, Los Angeles City Attorney Mike Feuer, CSUN students Sarah Mendez (front), Ian Lippman (back), Paloma Rangel (front), Janelle Howell (back), and Joscelyn Martinez. Photo by Lee Choo. California State University, Northridge’s Department of Criminology and Justice Studies is less than a year old, but its students are already working closely with the Los Angeles City Attorney’s Office to help officials there evaluate the effectiveness of some of its programs. Two teams of students spent about two hours last month briefing Los Angeles City Attorney Mike Feuer and other members of the City Attorney’s Office staff and legal team about what they learned about two of the office’s programs — the Prostitution Diversion Project and Neighborhood Justice Program — as well as ways the students thought the programs could be improved. Vickie Jensen, chair of the Department of Criminology and Justice Studies, called the relationship a “wonderful opportunity” for both institutions. Los Angeles City Attorney Mike Feuer looks on as CSUN student Sarah Mendez makes her presentation. Photo by Lee Choo. Camilo Cruz, director of the Community Justice Initiative (CJI) for the Los Angeles City Attorney’s Office, called the input from the students invaluable. “By partnering with CSUN and other campuses, students help CJI change the nature of traditional justice and engender new modes of civil engagement and restorative justice administration to enhance safety,” Cruz said. In this instance, students in criminology and justice studies professor Bruce Zucker’s community justice class divided into six groups and examined different programs in the City Attorney’s Office. They came up with suggestions to improve or advance those programs. The effort began last semester and culminated with two of the six groups being invited to make a presentation at the City Attorney’s downtown office in March. “This wasn’t just an exercise,” Zucker said. “(City Attorney) Mike Feuer and his staff, attorneys and non-attorneys, are dedicated to the idea of community justice. They are thinking progressively about criminal and community justice in Los Angeles. The students in Zucker’s community justice class took that message to heart. The teams of students who presented their ideas at the City Attorney’s downtown office in March demonstrated a thorough knowledge of the programs they studied and detailed suggestions on how to improve them. 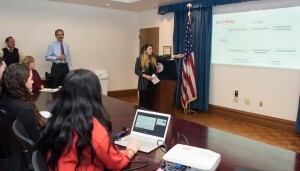 The second team offered ways to improve the office’s Neighborhood Justice Program, a restorative justice program that brings together perpetrators of minor crimes, as well as representatives of the community to collectively address the harm done and ways to ensure the crimes do not happen again. Each team engaged in an in-depth discussion with the program’s staff and legal team, as the professionals weighed the students’ suggestions and brainstormed how to carry them out. Feuer sat in at one point and peppered the students who studied the “John” diversion program with questions, which they handled with aplomb. Cruz, who also taught one of the class sessions in the community justice class, assured the students that Feuer would not have asked his questions if he had not been truly interested in what they had to say. Cruz said his colleagues in the City Attorney’s Office are giving serious consideration to the suggestions from the CSUN students, and are looking forward to continuing the relationship with the criminology and justice studies department. “I strive to infuse my office with students, so as to add thinking and fresh ideas that will help us increase the number of misdemeanor offenders participating in treatment and services that address the root causes of criminal behavior, thereby restoring lives and discouraging recidivism,” he said.